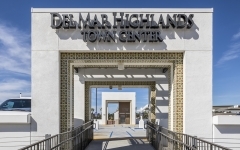 The new parking structure located at the Del Mar Highlands Town Center in Carmel Valley is part of a $50 million expansion and upgrade project. The center features over 380,000 SF of retail and commercial space, including a luxury movie theater, children’s learning center, and a wide variety of shopping and dining options. 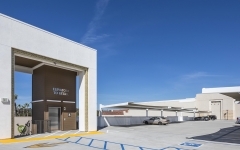 The 812-space parking structure was constructed in two phases and accommodates both a theater expansion and new daycare center on the roof level. 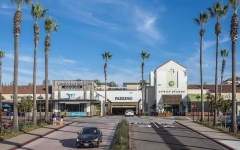 The garage serves patrons and employees of the complex and provides a much-needed increase in parking which previously consisted of only surface parking. 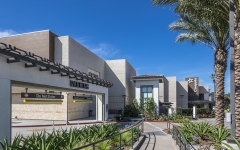 Visitors can access the center through the garage by any of the three entry points, as well as a pedestrian bridge which provides access to the upper-level shopping and dining facilities.